You want to help out on a large project. You find a Pull Request that someone else is working on and decide you want to help out. You make your changes and are ready to send a Pull Request but to your surprise you find that the fork you want to send your PR to is not listed. What now? It turns out this is a known limitation with GitHub's Pull Request implementation for network with many repositories. If there are too many forks GitHub filters the list to only include the most popular forks. I've contacted GitHub about this several times. This most recent time I got antsy and started poking around while waiting for a response and came to a workaround on my own. Huzzah! I've had mixed luck on what actually happens when loading the hacked URL. In at least one case either the "commits" or "files" tabs was missing content on viewing, despite having the correct number of items listed in the tabs. The PR worked just fine, though, so if you see this I don't think there is a lot of reason to be alarmed. 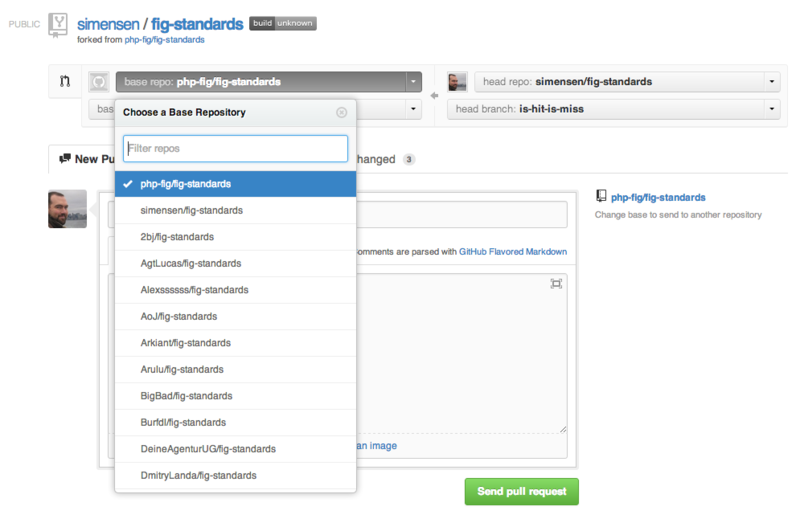 Hopefully GitHub will support this functionality natively sometime in the near future. Until then, this workaround should help people currently stuck on this problem.